In an epic show of riding rough-shod over local opinion and blatent pocket-lining, the laughing prince and his cronies are set to build on prime farmland with an unwanted development in Truro (big surprise!). Our already gridlocked capital will receive among other things; housing, a Waitrose and a park and ride, in one of the most congested parts of the city. I shudder to think what effect all that hard-standing will have in the flood-prone area just below. The sooner people get wise to the fact that Charles is effectively quai-sovereign of Cornwall, has the right of veto in the English (masquerading as a UK) parliament and along with his developer chums will summarily concrete Cornwall, the better for all. 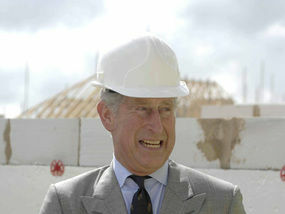 The Duchy of Cornwall is NOT a private estate. As for the Duke’s green credentials? Well they’re akin to something you might find in the field he’s concreting over, once the cows have left! Soon enough there will be nowhere for local people to live (don’t delude yourself into thinking the housing is for them! ), and no fields to grow the produce the Duke wants to sell in his quasi farmers’ market. This entry was posted on Friday, May 25th, 2012 at 9:50 am	and tagged with Cornish heritage, Cornwall, Cornwall Council, Duchy, Duchy of Cornwall, Duke of Cornwall, Kernow, Prince Charles, Stannary Parliament, Truro, Truro Eastern District Centre and posted in Cornish Heritage, Cornwall, Cornwall Council, Duchy of Cornwall, Duke of Cornwall, Kernow, UK Government. You can follow any responses to this entry through the RSS 2.0 feed.